What do you Feed your Layers? We grind the Fertrell rations on the farm. In short it’s corn, oats and roasted soybean mixed with aragonite and Fertrell Poultry Nutri-Balancer. Fertrell Poultry Nutri-balancer is mostly soft-rock phosphate and includes kelp, vitamins and probiotics. Our layers get the layer ration free-choice along with whole kernel corn and oats. They also get oyster shell free choice (makes the egg shell harder). Finally, they get a new patch of pasture every third day so there are always fresh greens and bugs available to them. This all changes in the winter. We winter the birds (and rabbits) in our greenhouse on deep bedding offering them the same feed along with several flakes up to a bale of hay daily. The deep bedding provides most of their protein requirements, prevents odors, generates warmth and makes great fertilizer for our gardens. The hay gives them a source of greens and seeds in winter and helps build up the bedding further. That’s the plan anyway. Who knows what will really happen. 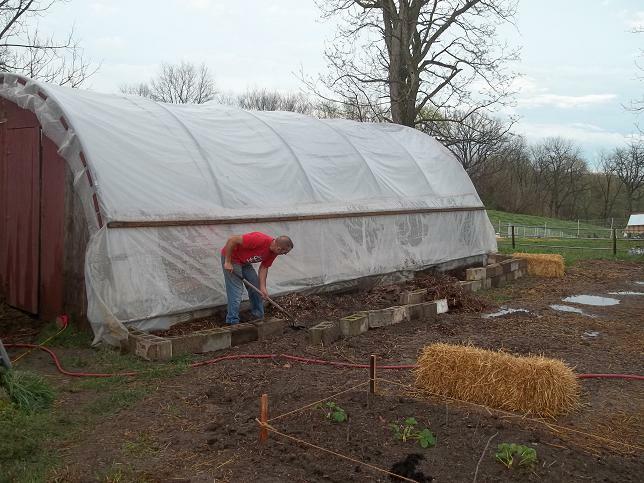 Might be even better once I get the other greenhouse built. 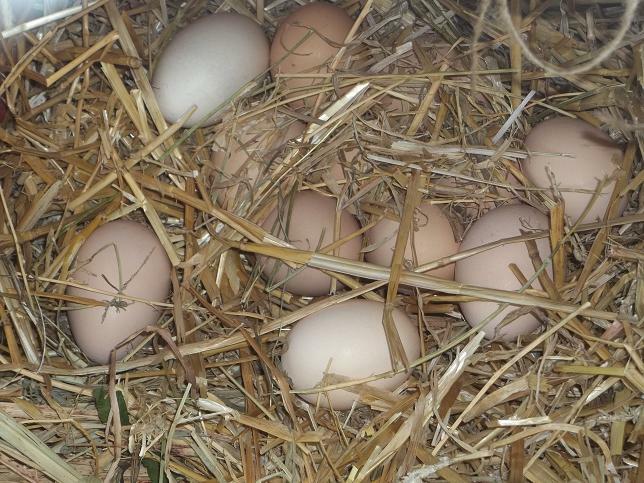 This entry was posted in Pastured Poultry and tagged chickens, Eggs, Hoophouse, Layers. Bookmark the permalink. 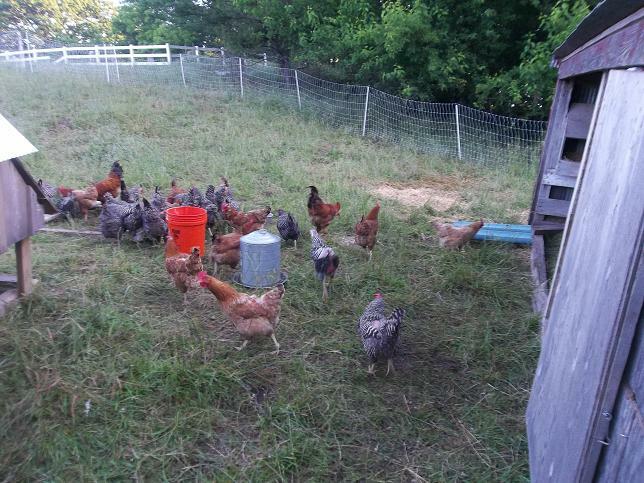 Love your motley crew – Barred Rocks for sure – Rhode Island Reds? They get wonderful meals that’s for sure. Ours get much more mundane fare – bagged veggie layer ration from the local feed store. They go out onto grass all day, year round, have access to oyster shell, and get a handful or two of scratch most mornings. Also a few kitchen scraps – watermelon rinds trump eveyrthing except the odd bread crust. We get similar comments on our eggs, and I’ve always attributed it all the green material and sunshine the ladies get. I like the hay idea, I’ll try it this winter. They eat all the stuff from their nest boxes as it is. BR, and New Hampshires mostly. I really prefer the NH hens. There are also a few RIR hens out there. A friend tried her hand at raising a few and decided they would be happier out here so there are white rock, Buff Orpington, Brahma and a few others. There are also a few Americauna of my daughter’s. It’s easy to know how much money she earns since her eggs are a different color. This year’s pullets are RIR and Sil Go Link hybrids with a bigger dose of Americauna. Hopefully my daughter will take over the whole egg business in a couple of years and we can drop the blue eggs.